The Reason You're Alive by Matthew Quick is a very highly recommended novel about a 68 year-old opinionated Vietnam vet who unflinchingly says exactly what's on his mind in his own way. After David Granger wraps his BMW around a tree, tests reveal a brain tumor that is subsequently removed. David blames the war and his exposure to Agent Orange for the tumor. He also strangely kept repeating a name while in recovery - Clayton Fire Bear. Fire Bear was a Native American soldier who was his nemesis. Granger is telling us about his life while writing this report, the book, and he will eventually get to what happened between him and Clayton Fire Bear, but first, during his report, we get to learn a whole lot about his life, his pride in serving his country, and his beliefs. He loves his granddaughter, Ella. He doesn't understand or respect his ultra-PC son, Hank. He detests his Dutch daughter-in-law. He loved his wife. He likes his gay friends, Gay Timmy and Gay Johnny. His best friend is Sue, a Vietnamese American. As Granger tells us about his life, in his own way and using his own word choice that some may find offensive, actually he is surprisingly open and supportive to other people. While reading, pay attention to his actions, not his words and you'll discover that Granger is a much more well-rounded, accepting, and compassionate person than perhaps his PC son and daughter-in-law, and others of their ilk, have ever been. Yeah, he's opinionated, but in the end I liked this old vet quite a bit. It made me think that if we paid more attention to the good in others right now instead of seeking out the worst behavior, we could bypass much of the polarization of ideological camps that is currently happening. Sure, Granger says cringe-worthy things all the time, but his friends see beyond the words and his irascible behavior, and adore the man. 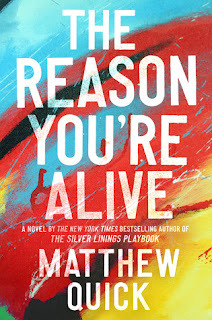 The Reason You're Alive is a fast-paced, clever, engrossing story about a man's life experiences. It is extremely well-written and, in some ways, an insightful, rewarding novel. I can guarantee you that if there is an offensive way to say something, Granger will say it. You will have to keep reading past the beginning and initial impressions, look beyond what Granger says and start noticing his actions. The David Granger you will know in the end is a much more complete picture of the man you see in the beginning. All the characters are well developed and unique individuals, but David Granger is singularly one of the most unique, honest characters I've come across in a long time.